A small batch brewery making a variety of different styles of beers using fresh Appalachian mountain spring water. 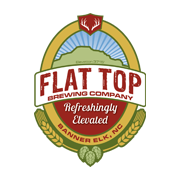 Flat Top Brewing Company is one of the highest breweries on the east coast in Banner Elk, NC at over 3000 ft. above sea level. Specializing in fine craft beer. Flat Top’s beer is refreshingly elevated.